Robotic End-of-Arm Tooling handles various baked goods. 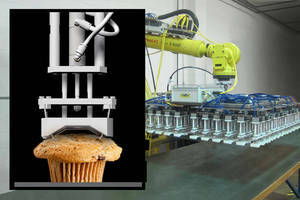 Robotic End-of-Arm Tooling for muffin and cake depanning accommodates products of different shapes and sizes. Unit features stainless steel needle grippers, each with 4 curved needles to depan 144 muffins from 2 moving baking pans on oven conveyor. Product compresses muffin spacing in 2 directions for deposit into retail and wholesale trays on conveyor nearby. Welded tubular stainless steel frame allows mounting of grippers, stroking cylinders, bushing rails, and actuating cylinders. >SAS< Automation, a leader in the design and manufacture of Robotic End-of-Arm Tooling (EOAT), recently introduced the latest in tools for handling different types of baked goods more efficiently. Commercial bakery products are can be challenging to depan as they are fragile and often topped with fruits, nuts or candies. "The >SAS< depanner accommodates a wide range of bakery products and is flexible enough to handle different shapes and sizes making it perfect for handling muffins, cakes, brownies, and cupcakes," said Rob Dalton, General Manager for >SAS< Automation. Designed for high volume and low maintenance depanning, the SAS Muffin Depanner has custom stainless steel needle grippers, each using 4 curved needles to depan 144 muffins from 2 moving baking pans on an oven conveyor. The small diameter needles leave limited evidence of penetration. A welded tubular stainless steel frame supports the mounting of stroking cylinders, bushing rails, needle grippers and actuating cylinders. In addition to depanning, the tool is designed to compress the muffin spacing in two directions for direct deposit into retail and wholesale trays on an adjoining conveyor. The tool is made of stainless steel, is wash down capable and ideal for very high-volume, continuous commercial operations. This tool provides the speed and repeatability critical for the depanning of baked goods with both needle grippers and food grade vacuum cups. "Automating this process has revolutionized the handling and depanning of bakery products. We are proud of the innovations we have brought to the industry by reducing labor and increasing productivity," said Dalton. >SAS< is a leading supplier of modular Robotic End-of-Arm Tooling, components, and gripper systems, capable of servicing any part and any robot. >SAS< manufactures in the USA "get a grip! ", and distributes Nile sprue nipper line, and Asian chucking/gripper line and is ISO 9001:2008 Quality Certified.